David Byrne on PowerPoint: Freedom — who needs it? You have to wonder what he was thinking, looking like he just came in from cutting the grass. Garr, really interesting points. I'm a business writer and the rationale is the same in writing for keeping it clear, simple & concise. If you confuse your reader or presentation audience with too many words, concepts or angles, you create the same effect as the amateur photographer using an over-stuffed composition - confusion and ultimate loss of interest. Also, it supports why it makes sense to start any piece of writing with a right-brain brainstorming exercise (creative), but then 'constrain' it with the application of left-brain (logical) clustering & structure. I write best under deadlines, like when my plane is landing in half an hour and I have about 10 minutes in which to finish a paragraph before the flight attendant politely tells me to shut my contraption. Less is indeed more. Thanks for the post. I think in a world of excess, the eye is naturally drawn to the simplicity of uncluttered design. 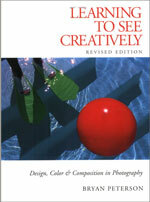 There was a big movement recently towards the importance of white space in print and on the web. I think we find it refreshing. It lets the mind breathe for a moment and makes it easier to know where the audience's focus should be drawn. This really rings true with me, since in my profession as trade show spokesperson (product demo gal), my job is basically to take the plethora of features and benefits in some new product--and in just five minutes, make them sound *simple. * And compelling and irresistible, but mostly simple, easy to use and cost-effective. My job is to simplify all the choices, options and features so that they are digestible and desirable. Not saying that the wide range of features isn't necessary, but you're right--they can lead to confusion and indecision. 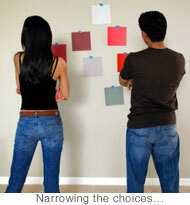 Making the choice simple makes it easier for your customers to make a choice. I think Schwartz is really onto something, and have referenced his book with clients for a couple of years, as they try to pile on more features and choices for users. 1. 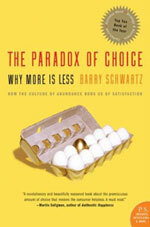 One arguement that people say to counter Schwartz is that if we had no or limited choices then people will be less happy, and Schwartz says as much. But what needs to be driven home is that it's not just about a product or service in isolation, it's about the aggregate of *all* the choices. If the overall choice load were low and you had to wade through a lot of choices for a single decision, that would be OK. 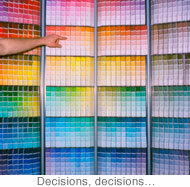 But everything now requires a lot of choices, that is wahat gets overwhelming. 2. Check out Yolo Colorhouse: http://www.yolocolorhouse.com/ They are an eco-freindly paint manufacturer (zero VOC) that has a very limited palette. But the colors are very well chosen and all go together. They have translated their weakness (inability to create a large palette due to cost/manufacturing constraints) into a strength (more focused decision for customer).